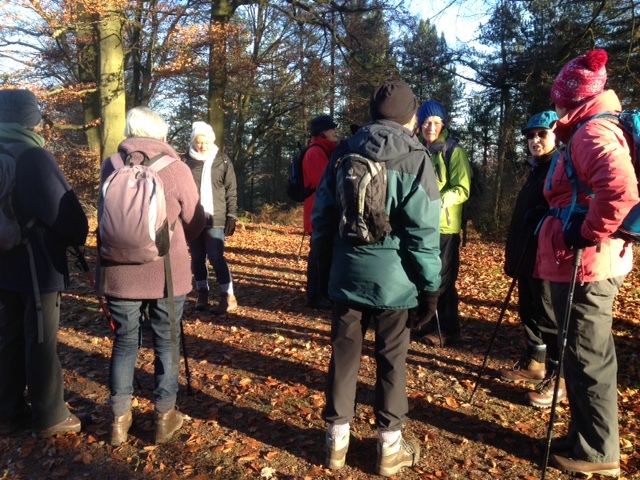 Thirteen of us turned up on a beautiful cold sunny morning, ready for a walk from Kelsall to Utkinton, to be led by Pat. Before ventuting outside, the thermometer had registered a temperature of not much more than zero degrees, and , as the following pictures show, we were all suitably dressed in multiple layers, and sporting an array of warm headgear. Compare the pictures taken today, with those of the walk on the 19th of July, where the temperature, and outfits, were very different! Pat had decided that we would do a linear walk today, because of concern about the state of the ground underfoot. Hence, a few of us had driven to the Rose Farm Shop earlier, and returned to the KCC in one car. The return transport was now in place . We walked through the forest in bright sunshine, keeping to the path and avoiding any muddy areas, as planned. This was a well known route for most of us, but the walk always seems longer, and steeper, each time we do it ! When we reached Rose Farm Shop, after a very pleasant walk of about four and a half miles, we were all ready for a hot drink.....but no cake! (We were all saving ourselves for the onslaught of Christmas eating, to be walked off next year)! 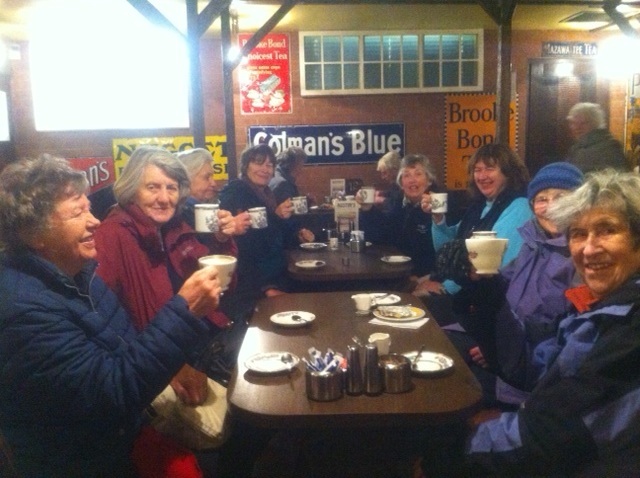 Ten walkers turned up on a grey drizzly morning to travel to Carden Park .However the weather was kind and rain kept off. We traversed part of Carden golf club and took time off to observe the legendary cave where a local hermit had lived in the late 18 th century. All because his parents wouldn't allow him to marry the love of of his life! The tale goes that he eventually moved to a cave below Bickerton hill which came to be known as Mad Allan's Hole, frightening the locals with his very dishevelled appearance. Another feature of the walk was the vineyard at Carden ,established about thirty years ago by John Broome who had originally developed the estate. It is noted as the furthest north wine producing vineyard in the country. Today, Evelyn led us on a very interesting and informative geology walk around the centre of Nantwich. We met outside the church, where Evelyn spent a few minutes explaining the various types of rock formation, some of which we would see later.We then spent some time inside the church , a beautiful space, once known, and possibly still known , as the cathedral of South Cheshire. There followed a two to three mile walk around the town, where Evelyn pointed out and explained the use of the various types of rock in the historic buildings. A cup of coffee was then enjoyed in the coffee/bookshop in the centre of the town . Today's walk ,was led by Myra, was about four and a half miles long in the area of Alvanley. Again, the weather was kind to us, and although today was officially the first day of the new Winter season, it was more like a late Autumn walk with the leaves still colourful on the trees , and many more crunching crisply underfoot.A thoroughly enjoyable morning! Although the18th October dawned with grey skies and a threat of heavy rain 10 members gathered. Then absolutely as the forecast had predicted at 10am a short burst of rain, just as we were kitting up, but then were blessed with fair weather all morning, only receiving the next showers as we much later, returned to our cars. 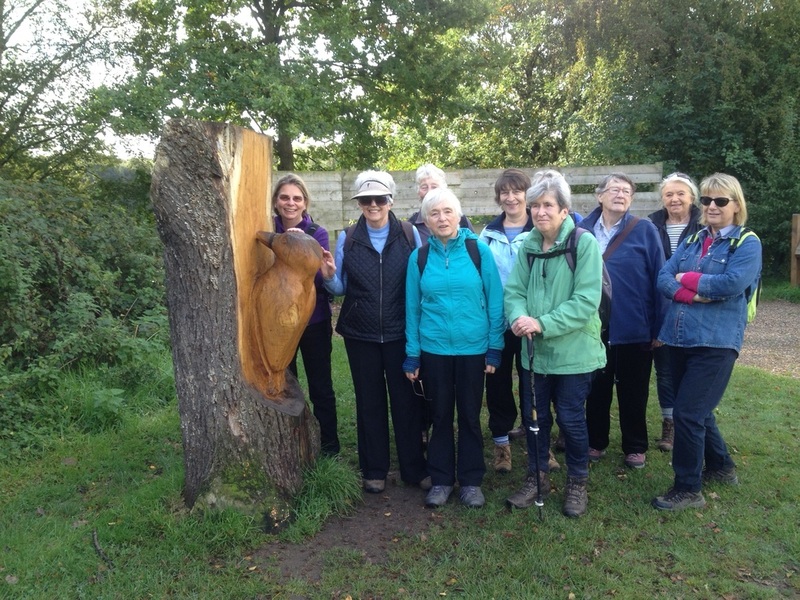 The walk was led by Cathy, the route circling Lymm Dam, taking in woodland shimmering with autumn colours and weird fungi, with a quick look at the The Wishing Bridge and ’The Bongs’. On the lake we spotted a cormorant, 2 grebe and many seagulls. After a footpath through a residential area we came to an elevated field footpath and had clear skies and a wonderful wide view to the hills of Lancashire and the Pennines. After a short seated break in St Peter's Churchyard, we continued on down the road, across Spud Wood field and onto the Bridgewater Canal tow path. The breeze was fresh, the water calm and tumbling leaves charmed this part of the walk. Now becoming a bit of a tradition, we reached Sexton’s Coffee Shop where we took refreshment, followed by the short walk through The Dingle back to the Dam woodlands and the car park. 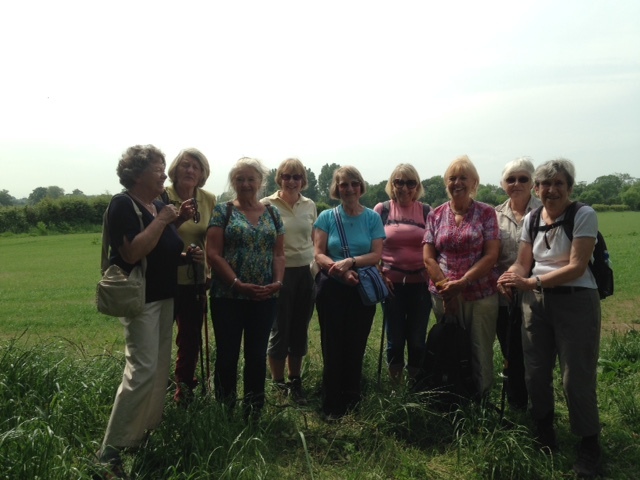 Eleven members and friends enjoyed a walk, led by Margaret, from Brereton Heath Nature Reserve through to the pretty village of Swettenham. The autumn sunshine was warm and bright and the walk took us via The Swettenham Arms where we stopped for a delicious lunch. 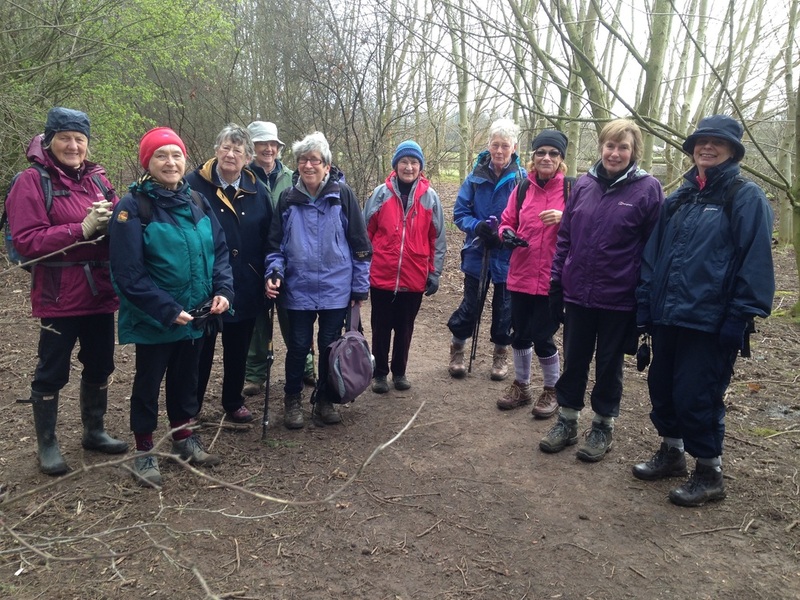 Today's walk, led by Anne T, was around Burwardsley, setting off from the car park at the Candle Factory. 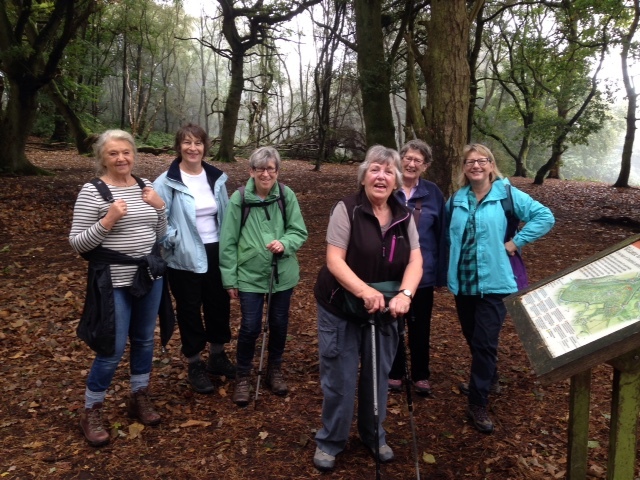 Although this walk has been done quite a few times in the past, it was a completely new experience for our recent joiners, and was thoroughly enjoyed by them and the "old hands" as well. There were seven walkers today. 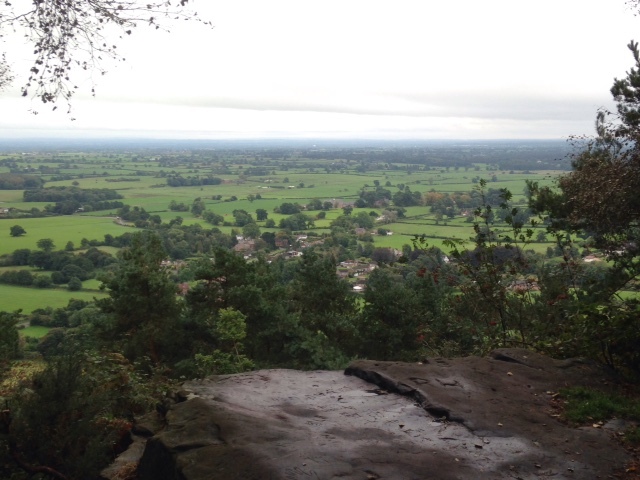 The trees in Bulkeley Wood were looking as majestic as ever, with some autumn colour creeping in , and despite a little low lying mist, the view from the rock on the edge of the wood, over the Cheshire Plain ,was lovely, as the picture below shows. There was one slight moment of nervousness, as we realised that cows were massing around the stile we were heading for. However, our fearless leader managed to negotiate a path through them without any mishap! Once again, we managed to complete the walk without any rain. In fact, it was a really warm day for the end of September, so we decided to make the most of it and enjoyed a very sociable coffee in the garden of the Candle Factory, at the end of our walk. A lovely varied walk today in very warm, humid conditions. 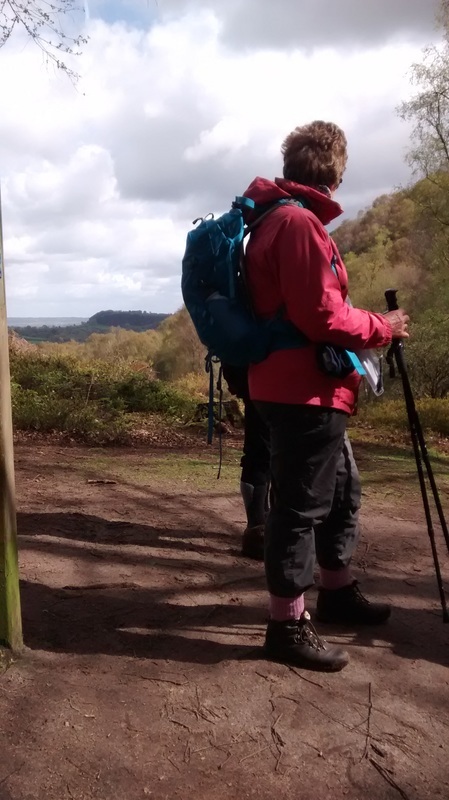 Vicky was our leader today and she led us around Peover and Peover Park which was really enjoyable. There were lots of hidden twists and turns during the 5.5 mile walk, but Vicky was a very good guide and navigated us safely. 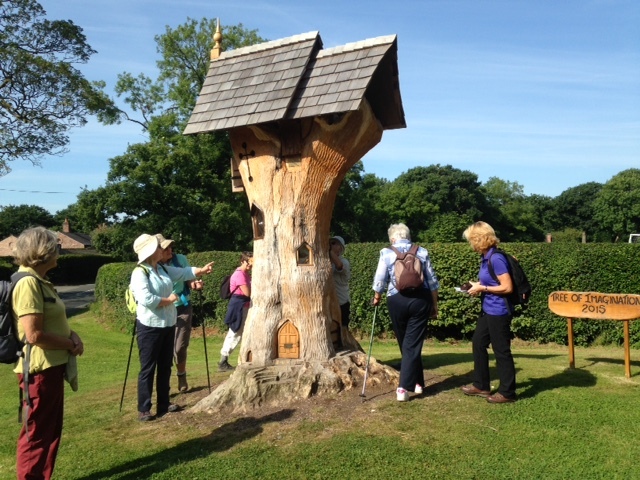 Just shortly after the start of the walk, at a quiet crossroads, we came across a wonderful tree sculpture, which you can see below. The Tree Of Imagination had been created in 2015 for the enjoyment of all in the area - it was just lovely! 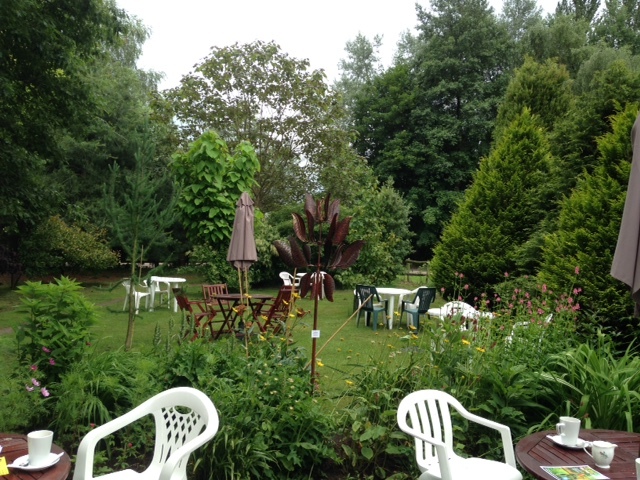 At the end of our walk we returned to the Bells of Peover pub, where we had left our cars. It was a unanimous decision to go have a refreshing drink before setting off for home, so we spent an enjoyable half hour sitting outside in the shade of the magnificent Wisteria. 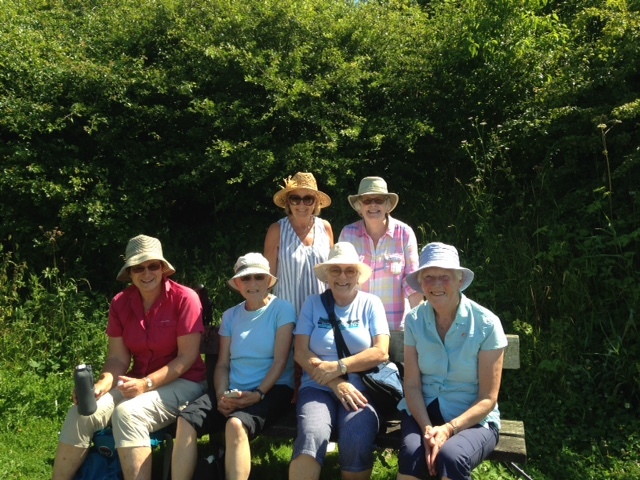 Only mad dogs, Englishmen and members of Kelsall WI would think of walking on the hottest day of the year so far,in a temperature of 28 degrees. That is exactly what seven intrepid ladies did this morning, on a walk led by Chris , around Neumann's Flashes, in Carey Park in Northwich. The high temperature forecast had definitely put some people off, but we had a thoroughly enjoyable , if rather 'warm' walk, a lot of which was through wooded areas , so we were sheltered from the fierce sun for some of the time . After so much rain lately, we were determined not to complain about the heat,or humidity, but to enjoy it, as the picture below shows only too well . The health and safety "Big Brother ' would be pleased to see us all sporting the appropriate head gear , and the odd splash of factor 50! A great walk enjoyed by us all....... six members, plus Chris's good friend, , who was staying with Chris and joined us for the walk...........and who also took the photograph. a good selection of sun hats! 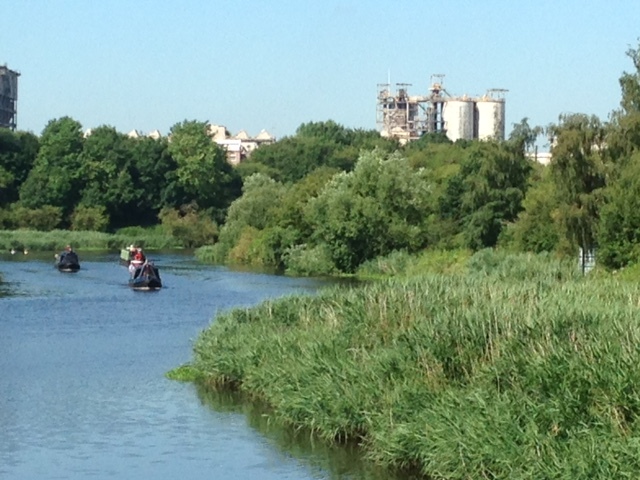 A blot on the landscape, or a very important landmark? Today was an early start for the walkers going on Janet's long walk around Mow Cop , the village that straddles the Cheshire /Staffordshire border.Four of our members accompanied Janet on the walk, and contrary to the sort of day that they were expecting, weather-wise, they had a very good day with no sign of the rain that fell on Kelsall . 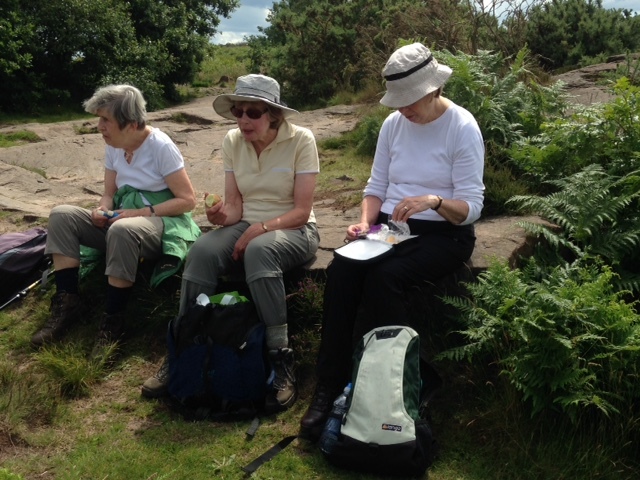 They had a really enjoyable walk, the first visit to Mow Cop for Myra, and possibly the others. 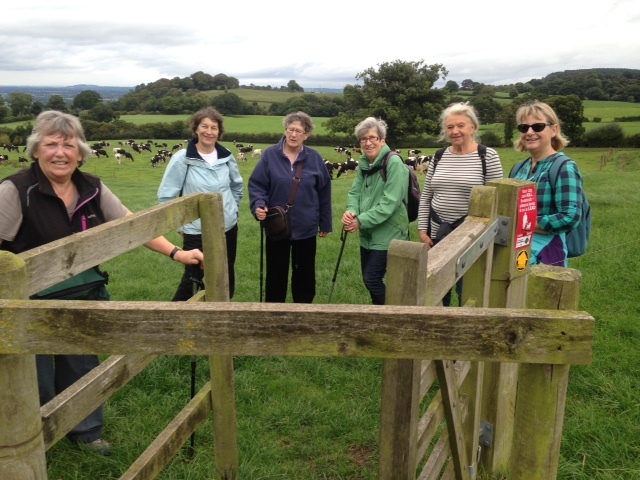 Perhaps Janet might be persuaded to lead this walk again next year , as she had such a small select group this time !? 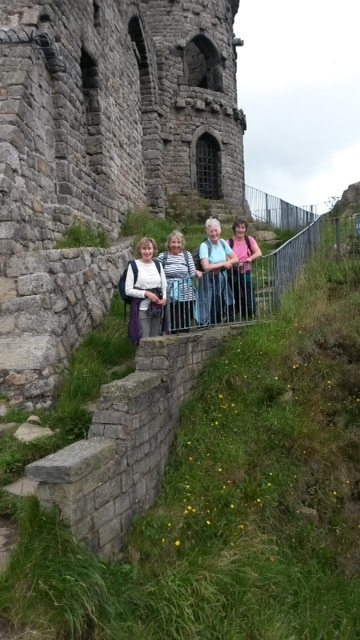 The pictures below, taken by Janet, show a very happy group, en route , and at, Mow Cop Castle . 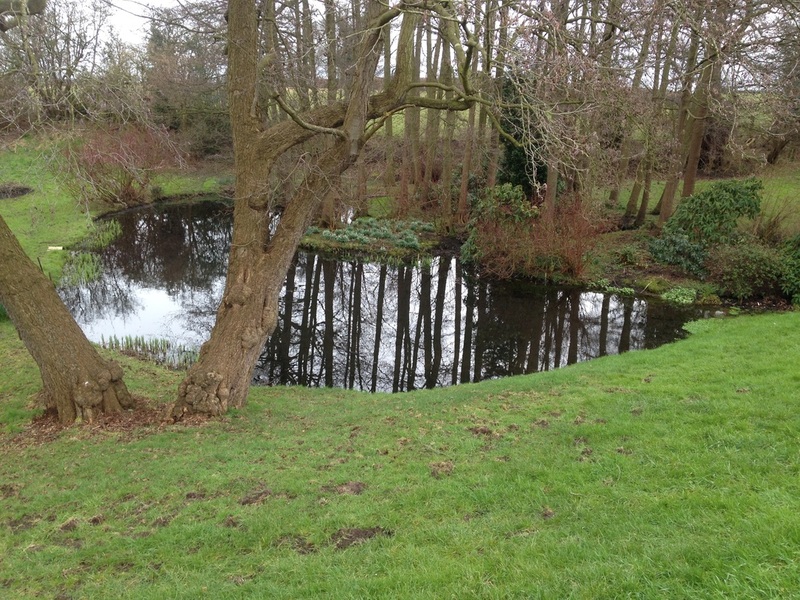 Today's walk was led by Anne H. along Oakmere Way, starting from Stonyford Cottage Gardens. 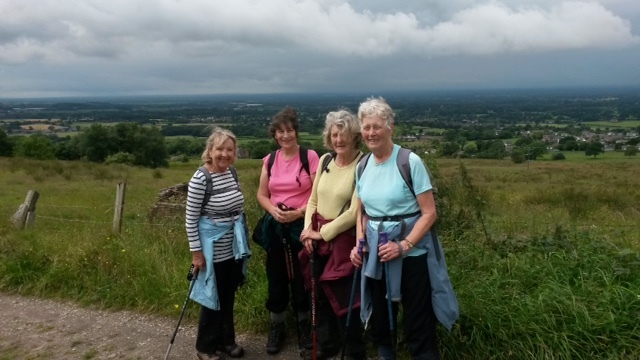 We welcomed one completely new walker, Dorothy and welcomed back Avril for her second walk with us. We had a lovely relaxing walk (for some of us anyway!) and we were very lucky to escape the rain. As always with our walks we enjoy the scenery, weather but more importantly the sociability and chat. Today, there was probably a little bit more chat than usual as we temporarily lost two of our little band. They were engaged in such animated conversation that they took a wrong turning and consequently did a lot more walking than the rest of us! 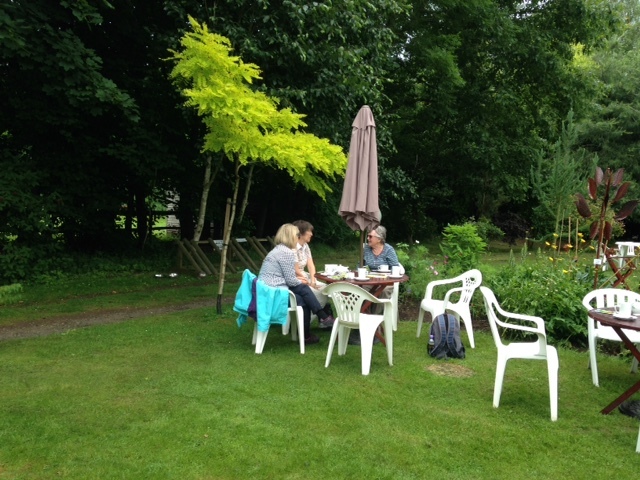 We were re-united amongst great hilarity back at the Stonyford Cottage Garden cafe and we all enjoyed a lovely cup of coffee, outside (as the next two photos show), just before the rain arrived. 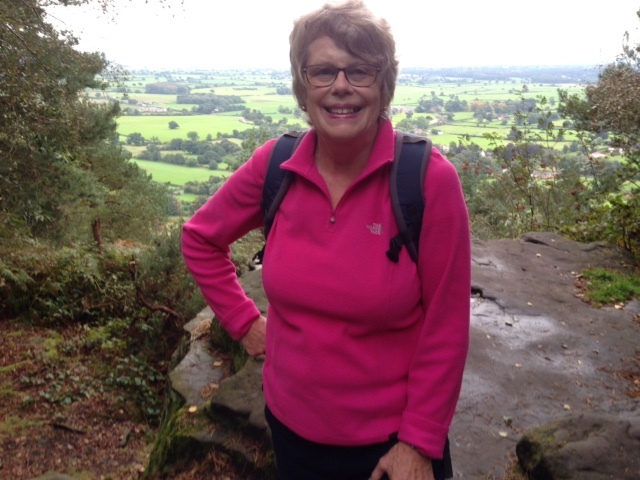 Today, Margaret led us on a five mile walk around Thurstaston.We set off from the car park in Station road, and soon, we were walking through trees in Royden Park, later to open out into open countryside, never too far from the coast. We had beautiful weather , which a lot of people were taking advantage of, either walking with their dogs , in groups, or cycling , as the walk incorporated a lovely long stretch of flat pathway. 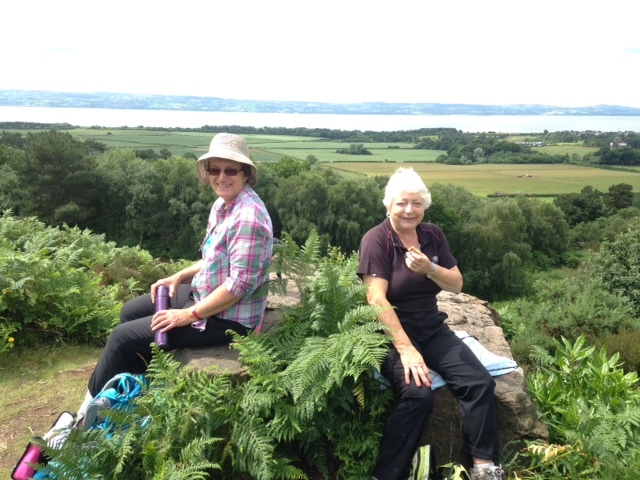 When we reached the top of the rock above Thurstaston , a magnificent view greeted us, where we could see across the estuary to North Wales. We took full advantage of this viewpoint as we ate our lunch, as the photos below will show. A great walk, in beautiful weather, with the added advantage of no cattle! Churton. We met a herd of cows and a bull; thankfully, they all seemed relaxed and did not pay any attention to the group, much to our relief. We continued on through a wooded area, and at Churton we crossed the road and made our way back to Farndon across the fields. 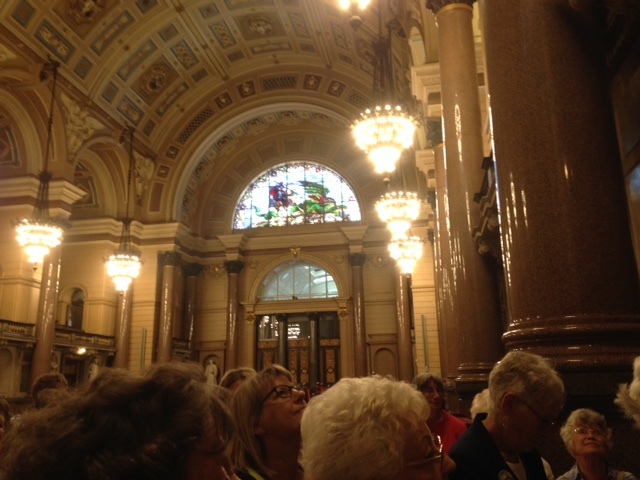 Twenty members visited Liverpool for a conducted tour of St George's Hall one of the most prominent and important buildings in the city. 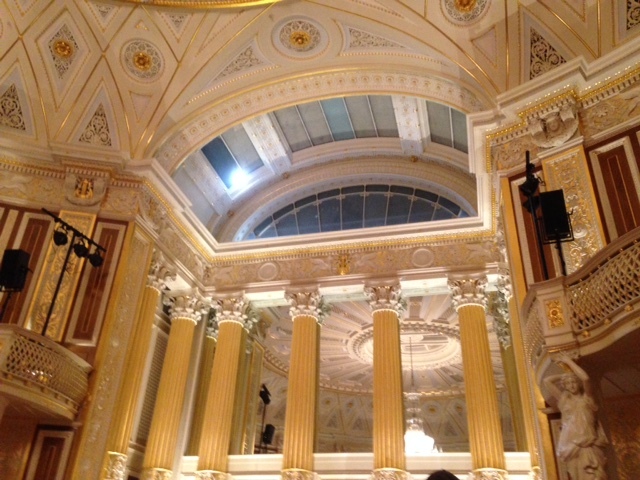 This is a tribute to the past of Liverpool,surrounded as it is by many other important buildings,notably the Walker Art Gallery,the World Museum and the newly rebuilt interior of the library. A poignant memorial to the Hillsborough disaster victims placed outside the hall was a reminder of the struggle of the relatives to obtain justice for their loved ones after twenty six years of striving. Evelyn tells me that we walked at least 1 1/2 miles!!! A very enjoyable summer's day ,with weather to match. (Pictures will be added to the report when available, and more pictures will be put up in the gallery). Pat led the walk today, following part of the Sandstone Trail, up to Maiden Castle Hill Fort. The weather was so much better last week, and we had a lovely walk in warm sunshine, with far reaching views when we reached the top of the hill . When we heard the sound of a cuckoo, very clearly, we decided that Spring had finally arrived. Woodpeckers were very much in evidence, but we missed the ponies which had been previously allowed to graze on the heathland. It's great to reach the top! Pat , surveying the view. 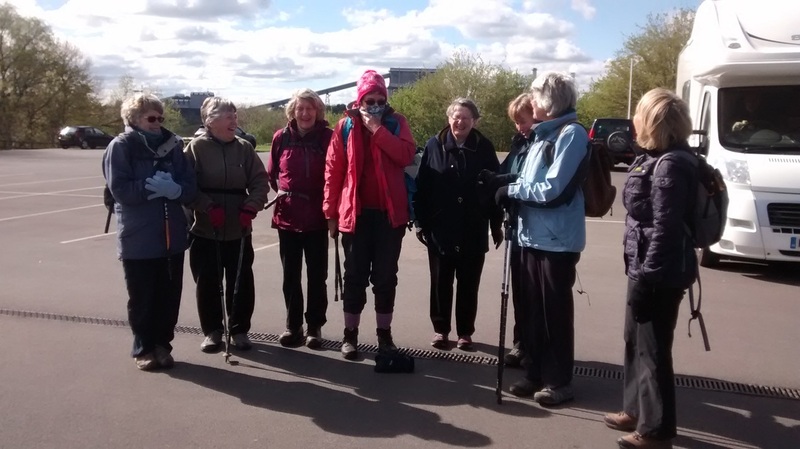 Today's walk was led by Dot ,starting at the Anderton Boat Lift car park . Although May was almost upon us , we were dressed for Winter, as the picture below shows only too clearly. Despite the weather, we had a most enjoyable walk, along canal banks, river banks and through woods where we could see bluebells and anemones. The photo was taken by Marie....but where is our leader? Dot must have been at the parking machine! 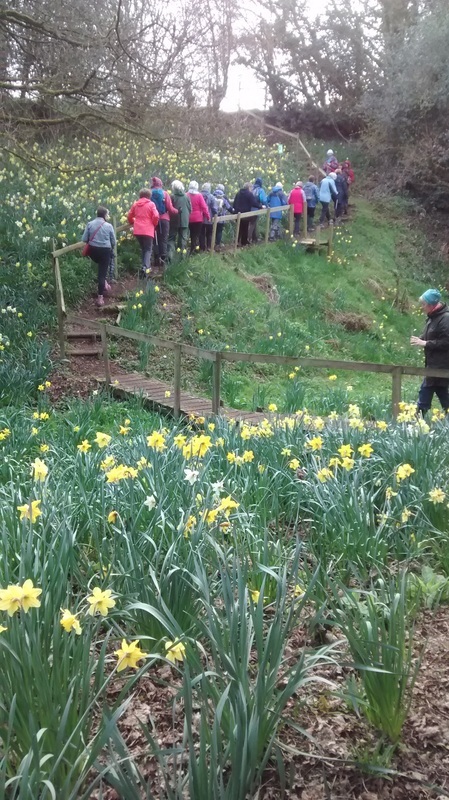 ​Daffodil Walk at Foxwist Farm - April 5th 2016 - with Marjorie and Les. Our April walk was spent on the daffodil farm of Len Tomlinson at Foxtwist Farm, Whitegate. A beautiful spring day found us enjoying the sight of thousands of these delightful "Ambassadors of Spring "
The farm is open for a week every spring to raise funds for the Macmillan Cancer appeal. Many of the properties of daffodils are now being investigated for their cancer healing attributes. Some of the chemicals cannot be synthesised and Len explained how his expertise is being utilised to this aim. A very enjoyable morning enjoyed by eighteen members. Picture below shows group walking through the daffodils. 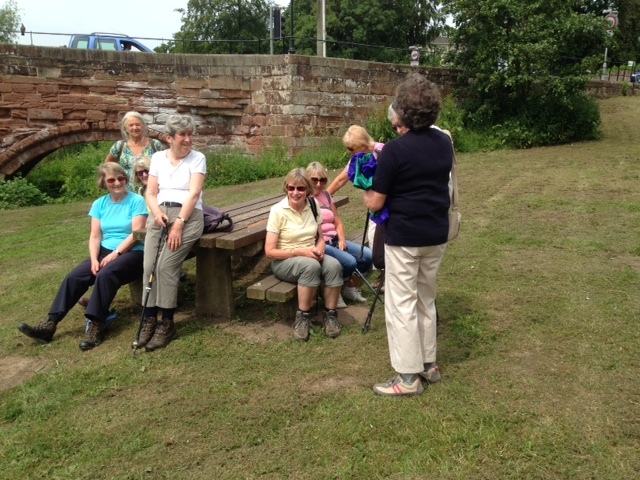 Today's walk was from Haughton Moss to Bunbury and back, led by Anne . This was a walk which we have done a few times before, a walk of about four and a half miles over fields, woodland , past ancient houses and the very attractive St Boniface church, and through the lovely village of Bunbury. We had a very enjoyable morning , as always, and apart from a very small smattering of rain , we remained dry. 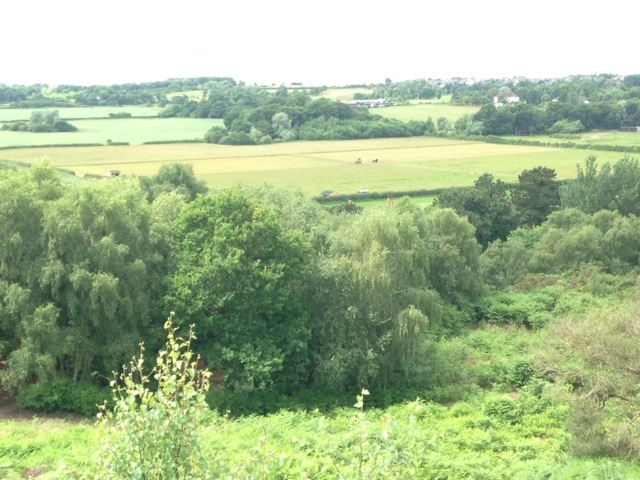 The photos below show the very attracttive Bunbury Common on Wyche Road, and the usual suspects being asked to stand to attention for the obligatory photograph! 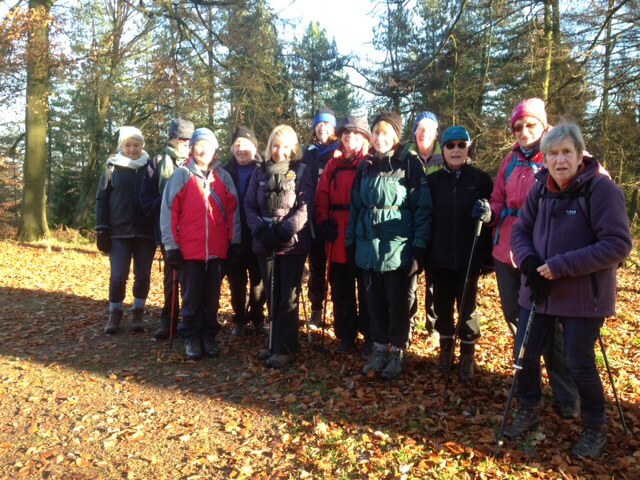 The first walk of the year took place on Tuesday the 9th of February, in Kelsall when 15 of us gathered to follow the treasure hunt, which we had originally held as a village event in September. Our president, Pat, had deliberately not divulged any details about the clues, (to those who who hadn’t originally taken part), because it had always been the intention to do it again, and today was the day! Three teams of three, and one of two, set off following clues, whilst Pat and Heather walked the route in the opposite direction. This was in order to check that not too much had changed since September, which might make the route tricky to follow. The treasure hunt started at the war memorial, opposite the Methodist Chapel, where Anne and Margaret tripped up on the very first question! (If they had read the information, they would have realised that the answer was 1914 to 1919, instead of 1914 to 1918). The route of the hunt took us up Grub Lane, along Brooms Lane into Old Coach Road, and across the main road into Waste Lane. We followed Waste Lane to the top, meeting Pat and Heather on their way down, and then counted the number of steps in the 39 steps (!! ), emerging, eventually, via the allotments, back onto the main road. We followed Chester Road down past the Co-op, finally ending up at The Royal Oak, where a very welcome cup of coffee, and Pat and Heather, were waiting. Once everyone had arrived, the very lively marking was completed, and the winners , with a score of 57 out of a possible 59 points, enjoyed a Kitkat each, while the others shared the remaining Kitkats ! 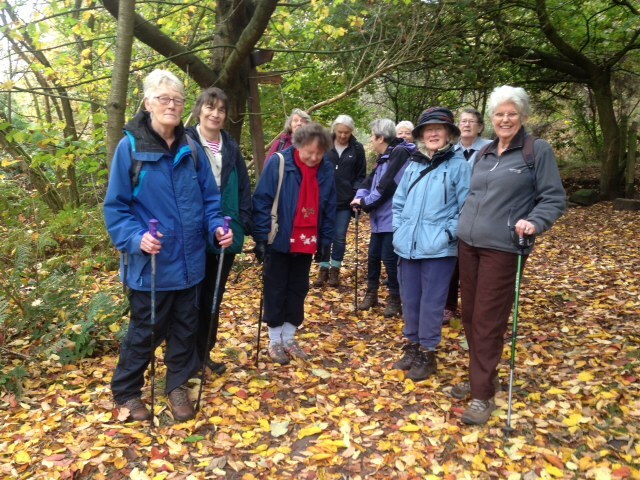 We all had a thoroughly enjoyable morning, and all of us agreed that it was a great way to ease us into the 2016 walking programme .